If not yet formally committed to the religious life, a postulant is at least invested in it, and it won’t go quietly from the heart or mind afterward. Insignificant things suddenly remind you that you’re not on the path to being a nun anymore. It hits like an actual punch to the ribs, and all you can do is brace yourself and think: Ouch. A few weeks after I left the convent, I looked around my new bedroom for somewhere to flop down and read, and realised with a shock that I was no longer subject to the custom that forbade sitting on the bed, because I was no longer part of the community which held that custom. Ouch. At Mass six months afterward, I stood for the Our Father and tucked my hands under the long cotton scarf I was wearing. I had left well before receiving the habit, but suddenly realised what a scapular would feel like draped over my hands, and that I would have been wearing one by then if I had stayed. Right on cue: Ouch. And the whole crowd of people from the district surrounding the Gerasenes’ country begged Jesus to go away from them, for they were thoroughly frightened. Then He re-embarked on the boat and turned back. The man who had the evil spirits kept begging to go with Jesus, but He sent him away with the words, :Go back home and tell them all what wonderful things God has done for you.” So the man went away and told the marvellous story of what Jesus had done for him, all over the town. Why had I never noticed it before? This one lonely everyman, overwhelmed by the love shown him by Jesus, begged to follow Him, and was gently told to go back to his family instead. 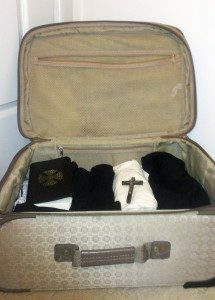 When I read that story during Lent, it was like letting out a breath that I’d been holding for the best part of a year. I was not the rich young man who had turned away sorrowfully out of love for the world. I was not the foolish bridesmaid who had brought a lamp but neglected the oil. Most of all, I was not the worker who put my hand to the plough and looked back. I was the one who knelt at His feet and said, “Lord, let me come with You!” and received instead the loving instruction to go home. Naturally, there are still things that catch me off-guard: During the morning Mass on Easter Sunday, I felt a rush of emotion as the familiar opening notes of Haec Dies flowed through the church. If your Sisters sang it every morning throughout Easter week, as mine did, you could probably chant the first two words in your sleep. Ouch. Forget nostalgia: this felt like hunger. God’s gift to me is the grace to be able to say now when that happens, “Lord, thank you for this pain – please turn it into something productive.” It took ten months for me to reach this level of acceptance, and I have a long way to go yet, but I’m grateful to be here. Oh my goodness, I can relate so much to this post! Those moments still come on a near daily basis, even two and a half years later. Just yesterday, I ran into a sister from my former community at Mass – a total surprise. I slid into a pew, saw her, and froze. OUCH…times a few thousand. That passage of the Gerasene demoniac was the Gospel the day before I left the convent several years ago. (My decision had been nearly finalized before, but what a way to end my time there!) Father’s homily that day focused entirely on how the order I was in was like the boat, and Jesus had called them to be in that boat. There were others who begged the Lord to allow them to come in the boat, to be in that particular order, but He told them to go back to their families, to proclaim to them what the Lord in His pity had done for them. Several hours after that, I had bought a plane ticket. Ouch. I’m grateful for how far I’ve come, and how much healing and grace there has been in these last two and a half years, but I can’t help but wonder… will those ouch moments ever cease? What an awful way to interpret the story! He really ought to have known better than to present the religious life as a fait accompli – even Sisters in final vows sometimes leave. I hope the superior of your former community had a serious conversation with him afterward, and let him know the unforeseen consequences of that little bit of flattery. To his credit, he realised that he’d stepped into a complicated situation and promised to pray for me, but I hope he learned how important it is to be careful when talking with people in formation! Thank you, Spiritu. I can relate to this. Today makes it six months out of my community. I have these “Ouch” moments all the time. Actually, I know I had one at Mass today when I remembered (again) my community’s response to the petitions (instead of “Lord, hear our prayer,” we say “Lord, have mercy” — see, I even still say “our” “we” as if I was still there, still joining!). Glory be to God that He uses our ouchies. Also, this Gospel reading is so poignant, after being told to leave, and wanting, desiring, begging to follow Him. Wow. Now I am learning and trying to follow Him wherever I am. We share an anniversary, then, but I’m a year ahead of you. 18 months ago today I was flying back over the Pacific Ocean. I’ll be remembering you in my prayers, little-sister-in-Him. ? The result is something very hard to shake… and moreover, I’ve started to enjoy having the skills to make a profound bow correctly (for example), and don’t want to lose what I’ve learnt, even if I’d look or feel less “nun-like” doing something else. I was thinking this week, too, (as training for a new teaching job is causing me to reflect on this) how encompassing life in a community really is. Not only is formation an engagement to our Lord but it also includes our work in which we are engaged everyday. So when I leave, not only am I confronted with the loss of the hope of giving myself to Jesus Christ in that community but I am also confronted with the loss of my daily work and duties which I enjoyed and became accustomed to. Once I can see how encompassing formation was, then I can understand better why leaving is as painful as it is and why I am reminded of it so much throughout my day. Perhaps this isn’t the most helpful comment to share! But it does help me continue to try to be gentle and compassionate with myself in light of my “ouch” moments. I still do some of those “instinctive” things I learned in the convent as well! For example — I remember how we were taught that in photos, we should have our hands folded in front of us, at waist level. It took me months after I got home to stop doing that! ? Thank you for this beautifully honest reflection! You are right. We definitely enter Religious Life with a sense of commitment. It is because it is Our Lord that we are commited to follow and love above all; there is no half-ways with Him, it is either all or nothing. We never give Him half of our heart. Yet, we can’t be afraid to really feel that pain because it is the only way to follow Him in this time. If we don’t say ”ouch” we are fooling ourselves and will end up being tormented from within. The man in the Gospel probably was sad at first (I’d imagine) but lived in a freedom of following Our Lord’s instruction and completely without fear, for, he didn’t just share these wonderful things with his family, but the whole town. What courage; only God can give that. Spiritu, you are indeed a gifted writer, but beyond that, you’re an empathetic writer. I personally DID receive the habit – albeit for a brief time – but my own experiences are very similar to yours. Which, I hope, reinforces your point. Its not about the time spent there. The thing is, most people who enter religious life really do so with ‘forever’ on their minds, and they throw themselves into it 100%. Its not the length of time. Its the extent to which one has given herself/himself without reserve. Thank you for sharing this reflection. And blessed be God for the growth He is working in you… and in each of us! Reading this post and these comments brought such a lump into my throat and tears into my eyes. Ouch, ouch, ouch! For me it is 25 years since I left, and I am still not really reconciled to it. But somewhere on this beautiful website I read a comment about loving God above any community or convent. That is following Him too, and I found that insight very helpful. I am grateful to have found out about Leonie’s Longing through a friend. I am still trying to learn. Sometimes the pain is so much that I have to say I am glad to know this life is not forever. Is anyone here familiar with the poem Evangeline by Longfellow? I relate to it deeply. The woman is faithful to her first love all her life, even though she is tragically separated from him, and many years later she finds him on his deathbed, and he dies in her arms. I just feel that (please forgive the melodramatics) I have no desire to follow another path and that the first two disappointments about killed me, along with any desire I have to try again. I will just quietly remain in the world and do all the good I can, but without marrying or entering another community; neither one is psychologically possible any more. Neither option attracts me. I am also repelled by third orders and lay associates; again I know it’s just my “feelings,” but those seem like play-acting to me. Well, just unloading here. You are all a wonderful bunch of ladies (and men) and it would be nice to meet in person some day! My dear big sister in Him – recall that Our Lord carried the scars of His redemptive suffering even in His glorified body. Thank you for showing us YOUR scar – it isn’t melodramatic to allow the Lord to work through your suffering. Nope, that’s life giving! Be of good heart – He isn’t finished with you yet. We are promised in the book of Jeremiah that Our Lord has for each of us a hope and a future. Even at the end of a 25 year (or longer) tunnel there can be light, and I would not give up hope on happiness in this world just yet – not worldy happiness, but HIS happiness, yet lived out in the world for all to see – both life and scars, present in the same body, a witness to the truth of the Resurrection. Let us pray for one another! Thank you, Bek! I will definitely pray for you, and thank you for your prayers and kindness! After leaving the convent I had still feeling vocation for the consecrated life but I had felt also that the right way is nor a religious order nor a secular institute nor any other assotiation. Then I “met” the vocation of consecrated virgins. First it had seen to me strange and unclear. But then I realized that it fits perfestly to me. Although for many religious sisters it is only “playing the consecrated life” a “the vocations for those who “are a little bit strange and not good enough to live in convent”. But this vocation is beautiful and I am grateful for it. Thank God for this blog and for all of you! I really pray for each of you. You give me an idea to start similar blog in my language. Hopefuly I will find time… Pray also for me, please. How wonderful to start one in your language. I pray that God will give you the time and the strength to do it! This is *exactly* what I needed to read. I was troubled by today’s gospel of the pearl of great price. I kept wondering what meaning the merchant and the pearl would take on if buying the field didn’t work out; like how religious life didn’t work out for me after years and on multiple attempts. This article consoled me. Thank you. hank you firstly for your beautiful article. It resonated very much with me. I left my community after almost 10 years with them. Those ‘ouch’ moments accompany me often. I have been extraordinarily blessed by God with a good job, stability etc. but my heart still longs for what was and indeed is so much part of me. There are so many habits, both material and customary that we pick up in the convent that take a long time to re- adjust. I had to laugh at Teresita’s description of posing for pictures with hands clasped at waist level ? For me it’s many things – the way I sit, stand, speak, walk…and even two years on there is still the shock of looking in the mirror and seeing a head full of hair instead of a veil! Many people I have met think it is just a matter of getting ‘used’ to a new life again but what we ‘pick up’ in the convent, what we learn in formation, what we seek, isn’t just a set of ‘externals’ but a way of being…we are and seek to be Religious and this desire within us doesn’t disappear as we walk out the convent door. It’s been nine months today since I left as a Novice. This was exactly what I needed. Thank you. As a vocation director, your comments fill me with pain that you have suffered, and things are difficult for you after discerning out or being sent home like the man in the Gospel. I encourage you, dear fellow sisters in Christ, to remember that every soul is the spouse of Christ by baptism, and you are being sent on a mission by the Lord Himself to “tell them all what wonderful things God has done for you.” God loves you with all His Heart and will surely reward the sufferings you undertook and your generous willingness. Be assured of my love and prayers for each of you!